I hope that all of you are enjoying the (mostly) warmer days. Our team is extremely pleased to announce that we have transitioned to Zoom (from GoToWebinar and WebEx) for participation in our live lectures. This change should be largely transparent, but we do think that there will be some noticeable improvements for all of our live viewers, whether you gather in a room with other participants and a site coordinator, or if you watch a lecture on your computer or portable device. I would like to encourage EVERYONE who attends a lecture to visit our new page on Zoom for Live Lectures at: https://unclineberger.org/unccn/about-unccn/zoom-for-lectures. We have also published this page as an article in the month’s newsletter. You should be able to find all the details necessary to successfully navigate the transition to Zoom. If you currently use GoToWebinar or WebEx to attend a lecture, we strongly suggest that you use the testing information found on the page prior to your next lecture, and call (919-445-1000) or email (unccn@unc.edu) our team with any questions or concerns. That said, I suspect that this will be a simple and positive experience for all involved. Let me close by saying thank you to each of you for your participation in UNC Cancer Network activities. We always look forward to hearing from you with your questions and suggestions. CThe UNC Cancer Network replaced WebEx and GoToWebinar with Zoom for all live lectures. Please see details, below, on how this change will impact all viewing of live oncology telehealth lectures. As promised, the UNC Cancer Network will begin using Zoom, starting with our RN and Allied Health Lecture at noon on April 11th. What this means for you depends on how you typically connect to our lectures. Up until the end of March, we had four ways that users could connect to our live lectures. Below, we outline what changes, if any, you will need to make to view our live lectures. You may now view ANY live UNCCN lecture by simply going to www.unccn.org/live. This link will always take you to the most current live lecture. We now have an improved look for our Mediasite player. Now, when you view lectures in Mediasite, you will always see both the video and the slides in a new and improved format. Please remember that viewing in Mediasite does not allow you to receive continuing education credit, unless you are doing so because we have indicated that this is acceptable due to a singular technical failure of another system. For those of you connecting with a video conferencing system, your system has already been tested by our AV engineer. On the day of the lecture, your system will automatically be invited into the lecture, approximately 30 minutes before the lecture start time. For most of you, you will simply need your site coordinator to make sure that your system in on, 30 minutes before the lecture. Please note that for just a few sites, there are network issues that prevent you from being invited. If this is the case, OR in the unlikely event that your lecture does not connect, please use your system remote or touch panel on your video conferencing system to dial into the lecture at the SIP URI provided on the lecture instructions (looks like: 111111111@zoomcrc.com – the actual number will be provided for the event). In the event that your system has not connected and it is 25 or fewer minutes before the lecture, please call us at 919-445-1000 for assistance. In the event that we are not able to assist, please connect to the lecture with a web browser in Mediasite at: www.unccn.org/live, or using the directions below for Zoom. We no longer support WebEx or GoToWebinar. These two services have now been replaced with Zoom Webinar. To join, you will first need to register for the event. Please remember that if you are going to receive continuing education credit for the lecture, you must attend via Zoom or in a group setting with site coordinator. This is the same as it has been in the past, with Zoom now replacing GoToWebinar and WebEx. Zoom works on just about any device, including PC or Mac, as well as Zoom Mobile Apps for iPhone, Android, etc. To test if Zoom has been installed and is working properly, we strongly recommend that you go to: https://zoom.us/test. If this link opens Zoom, you are ready to join a lecture. If not, follow the download directions to download Zoom on the test page (or go to https://zoom.us/download), and try https://zoom.us/test again, once Zoom has been installed. Please note that a Zoom account (Zoom username and login) is not required to join UNCCN lectures. If you have one, that is fine, but you are not required to have a free or purchased account; only the downloaded application. When using Zoom, we strongly recommend that you register ahead of time for the lecture. This is required for credit, unless you are with a coordinator. You can do so by going to www.unccn.org/events. Please find the event that you wish to attend and click on the link with the title. This will direct you to a page with event details, including a friendly, orange button indicating “Register to Attend via Zoom Webinar.” Clicking on this button will take you to a link where you may register for the event. After you have registered, you will receive an email with a link to “Join from a PC, Mac, iPad, iPhone, or Android Device.” The link is a long URL beginning with: https://unccn.zoom.us… followed by a long string of letters and numbers. This is the link you will select when you are ready to join the lecture. We suggest joining at least 10 minutes before the event, to ensure that everything is working properly. Please note that the link you receive in the email is personalized to you. Please do not share this link with others, as the link is unique, and it may only be used with a single device. Also, you will need to register separately for each lecture. In the event that you decide to register for a lecture after it has actually begun, you should be automatically linked to the lecture as soon as you register. Just remember that in order to receive credit for live, for-credit lectures, you must attend at least 50 minutes of the lecture (tracked in Zoom). In the event that you have additional questions, a robust Zoom support page is available at: https://support.zoom.us. This includes several Zoom tutorials that may be helpful. In the event that you still need assistance with Zoom after looking at the Zoom support page, please don’t hesitate to contact us at 919-445-1000or unccn@unc.edu. 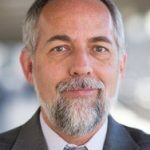 People have been using the UNC Cancer Network Learning Portal (https://learn.unccn.org/) for our Live lectures for about a year. Oncology professionals participate in RN and Allied Health or Medical and Surgical Oncology lectures in order to receive continuing education credits. Cancer patients and their caregivers listen to our Community Lunch and Learn lectures to learn more about this life-threatening disease. North Carolina Community College students attend lectures to augment their classroom education. In the last few months, we have been adding courses to our Enduring Materials collection. With Enduring Materials, anyone can watch an hour-long course according to their own schedule; these presentations are available at the click of a mouse at any time of the day or night. As each Live lecture finishes, we begin the process of readying that lecture for Enduring Materials. For oncology professionals, the addition of Enduring Materials courses means that they can receive continuing education credit for the UNC Cancer Network lectures at a moment that is less hectic. As with our Live lectures, oncology professionals can use Enduring Materials lectures to obtain CME, ANCC, and ASRT continuing education credits that are approved by the School of Medicine, the School of Nursing, and the American Society of Radiologic Technologists. These courses are available for continuing education credit for about year, after which they will be available for viewing on the UNC Cancer Network’s learning portal without credit. 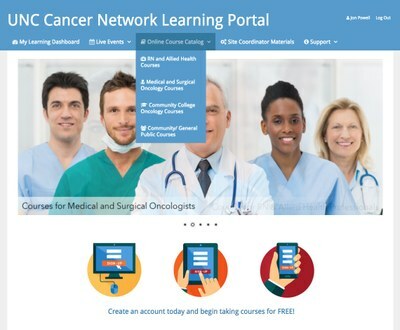 With the Community Lunch and Learn and North Carolina Community College lecture series, the UNC Cancer Network makes each lecture available on the learning portal within a few days. In this way, cancer patients and their caregivers can watch the Community Lunch and Learn lectures whenever they wish; whether it is to watch a presentation for the first time or to share it with family and friends. Meanwhile, community college faculty and their students will find the North Carolina Community College lectures in the UNC Cancer Network’s Enduring Materials collection convenient, as they are readily able to integrate past lectures into each semester’s curriculum. Our course library is in a growth phrase. As of the beginning of April, we have three RN and Allied Health lectures, 14 Community Lunch and Learn lectures, and two North Carolina Community College lectures in the Learning Portal. An additional five Medical and Surgical Oncology lectures and four RN and Allied Health lectures are in the certification process to be added to the Learning Portal. In the coming months, we will add each lecture about a month after the live lecture as well as a backlog of seven North Carolina Community College lectures. We hope that our Learning Portal helps fill your continuing education or informational needs.